Why You Should Choose These Banstead Log Cabins UK. These Trentan ‘Banstead’ Scandinavian log cabins are a superb size and this ensures the greatest amount of uses which you can share with your family. Being massively versatile these cabins will suit all manner of uses from a summerhouse, to a garden office, or maybe a games room, or ‘hidey-hole’ and haven away from the world. Your family and friends can share this ‘Banstead’ cabins with you and you will then be able to appreciate how wonderful the outdoors really is. Designed to fit superbly into most garden effortlessly – and that is what good design should do. Now with the latest DGP+ doors and windows. 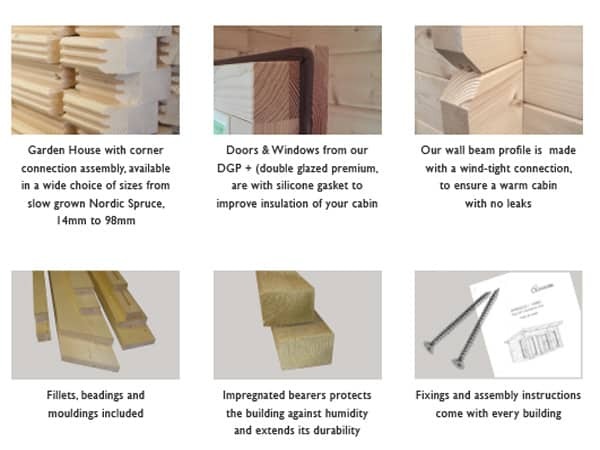 Nordic slow growing timber is renowned and loved by the Swedes and is the mainstay of these super log cabins. The cold weather in those parts of the world encourages the sheer strength of the timber. This is utilised in these’ Banstead’ log cabins and this ensures a very long life. The modern style of this log cabin is designed so it can sit easily in your British garden and the natural design is there in all its glory. Extra windows can be an option if that suits your needs and this ensures the natural looking standard windows will enhance your home. It’s your log cabin so remember it should be your choice. The Materials Used Is Key to A Quality Log Cabin. The ‘Banstead’ cabin is constructed from Nordic solid timber. If you are trying to save a few pounds by using chipboard, OSB board or other nasty and cheap materials you won’t find them in these log buildings. You could save a few hundred pounds using cheaper materials from companies which manufacture DOWN to a price – but this is NEVER a good idea. Quality should always be your number one aim. You will see that this quality aspect flows through to the double glazed doors and windows, in proper glass (not plastic). The latest superb adjustable hinges come as standard as do double seal and European furniture (not cheap Chinese. Our kilned dried timber naturally only comes from sustainable sources. The clever design of this ‘Banstead’ garden log cabin means it’s easy to assemble and this originates from the work in the factory where they are pre-assembled to ensure all parts fit correctly. They are then flat packed with all parts bar coded for ease of assembly in your garden. Many people will enjoy assembling these log cabins but you may decide you would like it erected for you. Well, no problem! The optional erection service by a third party will ensure a nice, easy life for you and your family. That’s got to be good! It’s very easy to find many Scandinavian cabins on the ‘internet’ and the clever web designers can make them look really great, however, what is it like in ‘real life’ and, more importantly, how do you find out. There’s really only one way and that is to take a drive and go and view one ‘in the flesh’ By doing so you can ensure that your choice is the right one for you. This will also ensure that you know the expected quality and that there won’t have any nasty surprises. Near to Woking and Farnham, we do have display sites and you can view examples of these log cabins to see the quality. Highly recommended and well worth doing! Many Years of Garden Buildings Experience. Our family business background in garden buildings manufacturing started way back in 1979 BT (Before Thatcher). Take advantage of this experience is your choice because it’s important to know how about the quality of materials which should be used. Our Ethos is ‘Make to a Standard – NOT down to a price’. This means you can be sure that your log cabin will meet your needs. Size: Size is 5.1m x 3.3m (17ft x 11ft nominal) Pent Log Cabins or single slope Style. Note this is the external size of the body of the cabin. The lugs extend 100mm on each corner making the overall size (as most other companies quote) 200m larger. We mention this so you know you are comparing ‘eggs with eggs’. Approximate clear internal size will be approx 5.0m x 3.2m. Please check with us if internal size is crucial. Cladding: Standard interlocking Scandinavian log buildings are 40mm thick and slot into each other. The log profile has designed wind-tight connections to ensure a superior resistance against wind. Untreated. Kiln dried timber from sustainable sources. Floors: 18mm thick T&G untreated boards used on these floors. No chipboard, OSB or other cheap sheet materials used on the floor, unlike some other suppliers. Floor joists are 70x45mm and are normally spaced no more than 650mm apart. 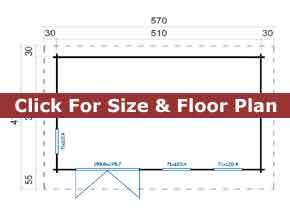 All floor joists are pressure treated for long life as standard. 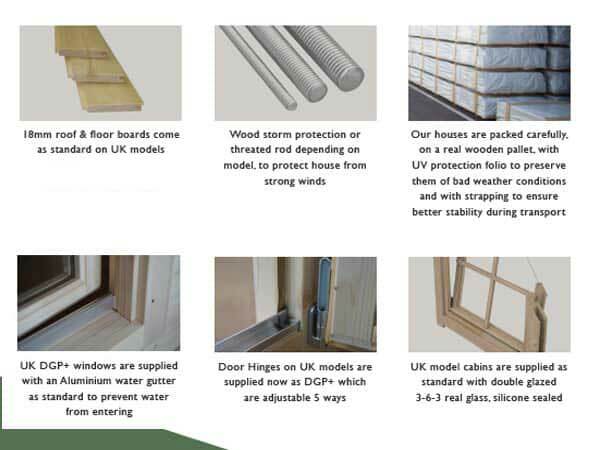 Windows: Three (3) contemporary style joinery quality inward opening windows included as standard. Size of each window is 71cm wide x 124½cm high (28in x 49in). Complete with easy adjust hinges, silicon gasket seals and delightful silver finish window handles. Supplied untreated as standard. Double glazed as standard NOT single glazed. 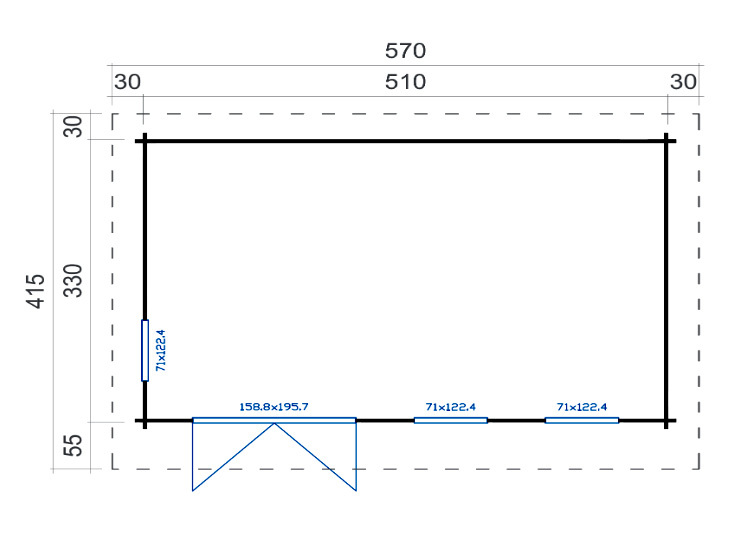 Lower Walls: Height: 188cm (74in) – on all Banstead log buildings. This Banstead Log Wood Cabins is a delightful and stylish pent cabin building with the large roof overhang transforming this building to another level. You have a choice of windows so this cabin will reflect your taste ensuring it will be a proud asset for you and your garden. This Nordic wood cabin is less than 2.5m tall for planning and fully double glazed for comfort.